Stephen Atkins Swails (1832-1900), U.S. Army officer and state senator, lived in a house on this site 1868-79. Swails, a free black from Pennsylvania, came to S.C. in 1863 as a 1st Sgt. in the 54th Massachusetts Volunteers (Colored), the first black regiment organized in the North during the Civil War. He was wounded twice and was commissioned 2nd Lt. by Massachusetts Governor John Andrew in early 1864. Swails, one of only about 100 black officers during the Civil War, was promoted to 1st Lt. in 1865. 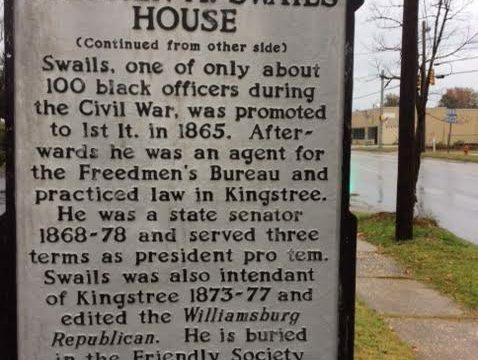 Afterwards he was an agent for the Freedmen’s Bureau and practiced law in Kingstree. He was a state senator 1868-78 and served three terms as president pro tem. 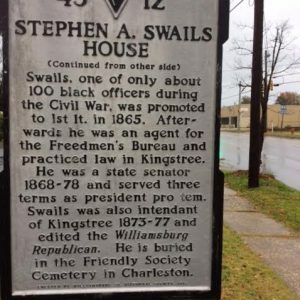 Swails was also intendant of Kingstree 1873-77 and edited the Williamsburg Republican. He is buried in the Friendly Society Cemetery in Charleston.